News flash: most motorcycles have very little cargo-carrying capacity. That’s why tank bags were invented. 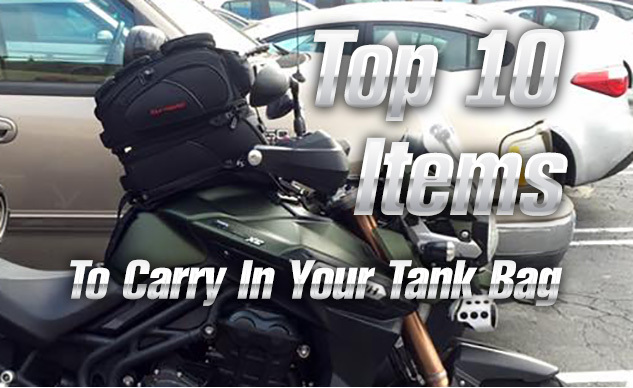 You can easily carry the little essentials you may need on your ride in a form factor that’s easily removed from your motorcycle. Still, in all my years riding, I’ve never had a tank bag stolen or looted when sitting unattended on my bike. For riders who have hard bags on their bikes, I’ve seen folks use a nylon bag with organizer pockets to carry many of the items on this list, making it possible to compartmentalize the gear like in a tank bag. Yes, I know I have a reputation for overpacking when the MO gang goes on tour, but I’d always prefer to carry a little bit of gear I didn’t need than find myself stranded. Look at each of these items as a suggestion and then consider whether it applies to your riding situation. For example, after living in Southern California for almost 30 years, I stopped carrying the rain gear that was always in my tank bag when I lived in the Northeast. Use the comments below to list the necessities I’ve forgotten.